When most people think of Lobelias they are looking for Lobelia cardinalis (the cardinal flower), widely used in cottage gardens and is a brilliant flowering species for the boarder. It is used widely as a ground cover as it forms a dense clump over time. Tall red flower red spikes up to 150cm tall in mid to late summer add color to any garden. Lobelia erinus are another popular species widely used in hybridisation. Treated as a perennial it is actually not, the plant created offsets each year and the old plant dies, however that is a little immaterial to most gardeners. Lobelia cardinalis grows well in a humus rich moist soil in full sun to part shade. Dig in some coco peat and well rotted compost to help retain moisture. As new growth appears in spring we like to water with some liquid seaweed fertilizer. Plants can be cut back in late autumn as they die back. This is also the time to top dress with some well rooted compost. Divide larger clumps in late winter to early spring as the soil warms up. A few other species are available and make interesting additions to the garden. Lobelia inflata is known as the Indian tobacco plant. 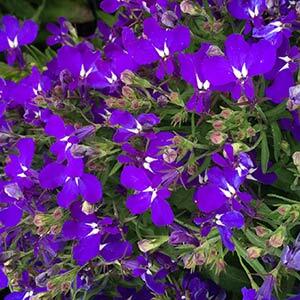 Lobelia anceps is an indigenous species known as the Angled Lobelia, low growing with mauve flowers.